The Child Passenger Safety Program focuses on promoting proper safety seat restraint use for children until they transition to the vehicle safety belt (approximately birth through nine years of age), increasing risk perception and correct usage of child restraints among parents and caregivers through outreach and education, providing proper installation education and addressing the barriers that prohibit access to safety devices. The American Academy of Pediatrics and the National Highway Transportation Safety Administration recommend using a rear-facing child safety seat until 2 years of age or longer if the seat has higher weight and height limits specified by the manufacturer, which can be as high as 40-50 pounds for newer seats. Never put an infant in the front of a vehicle with an active passenger airbag. When children outgrow their rear-facing safety seats they would ride in forward-facing child safety seats, in the back seat, until they reach the upper weight or height limit of that particular safety seat. It is best to use a 5 point harness as long as the safety seat will allow before graduating to a belt positioning booster. Once children outgrow their forward safety seats, they should ride in booster seats, in the back seat, until the vehicle seat belt fits them properly (never before age 8). Seat belts fit properly when the lap belt lays across the upper thighs and the shoulder belt fits across the chest (usually when they are 4’9″ tall). When children outgrow their booster seats and they are 4’9″ tall, they can use the adult seat belts in the back seat, if they fit properly; lap belt lays across the upper thighs and the shoulder belt fits across the chest. 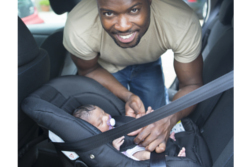 Virginia Law requires that all children age 7 years and younger to be properly secured in a child safety seat or booster seat regardless of the child’s weight or height.